Welcome to the No Croutons Required roundup for March 2016. I have 11 tempting dishes to share this month. As always, a special thanks to everyone who took the time to share a recipe. Without further ado, see what has been appearing on tables this past month. 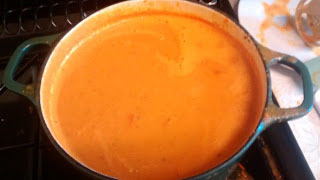 I do enjoy tomato soup but only if it is homemade, like this delightfully quick and easy one. All you need is sauteed onion, red peppers and cherry tomatoes. Then add some tinned tomatoes with some water, whiz it up and add corn if you please. 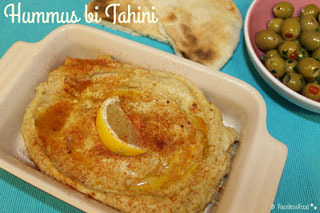 I am sure this would make for a lovely lunch or light dinner with some crusty bread. 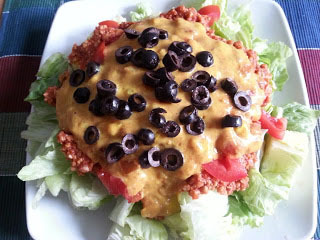 Dreaming of summer here and this delightful no cook salad with have your mouth watering. 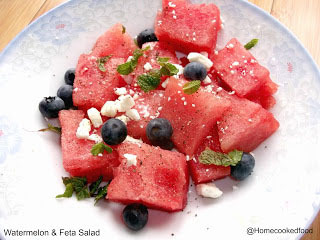 Refreshing watermelon comes together here with feta, fresh mint and some black pepper. Easy and yes please. Next up is another salad and this one is certainly substantial. A meal in a bowl, roasted squash is combined with cranberries soaked in orange juice. Reserve the juice for the dressing. 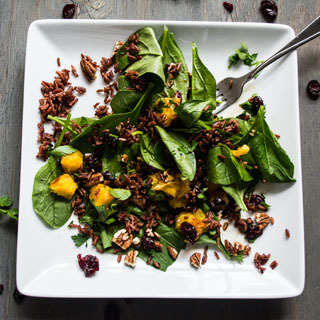 Combine the squash with spinach, cranberries, pecans, rice and parsley and dress with the reserved orange juice, orange zest, balsamic vinegar, garlic, maple syrup and olive oil. 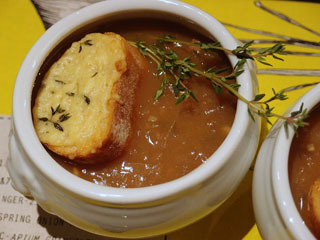 After a refreshing cold weather walk, you can come home to this delicious soup to warm your toes. Roasted butternut squash, carrots and onions are then simmered with some vegetable stock and seasoned. Easy and satisfying. My contribution this month is this colourful salad with lots of goodness. 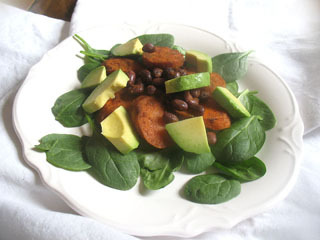 I combined akuki beans with roasted carrot tossed with olive oil, paprika, and some cayenne. Then everything was dressed with olive oil, fresh lime juice, red wine vinegar, garlic, cilantro and mint and served on baby spinach leaves. This lovely soup starts with slowly browned onions. Garlic is then included, along with dry cider, bay leaves, thyme and yeast extract. Served up with toasted baguette slices and cheese, this is surely comfort in a bowl. Next up is this impressive salad that features roots. I'm smiling too. 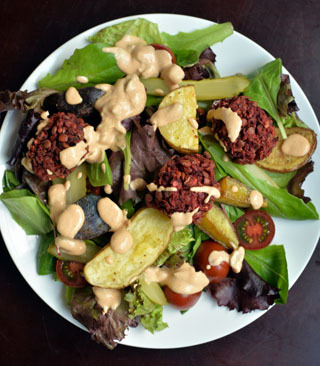 Packed full of goodness, we have roasted beet balls with lentils, bulgar, onion, thyme, oats, some ketchup and oregano. If that wasn't enough, some roasted potatoes are included, along with greens, tomato, and pickles. Toss this all with a dressing consisting of raw cashews, fresh lemon juice. olive oil, garlic, miso, Dijon mustard, sun-dried tomatoes and more pickle. For sure this a healthy meal. 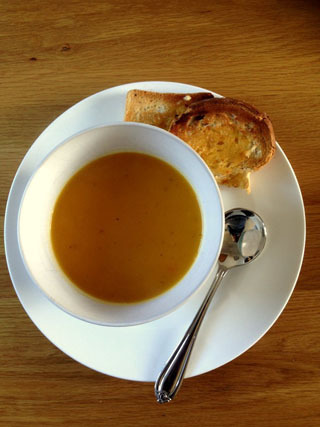 Here we have another mouthwatering butternut squash soup. 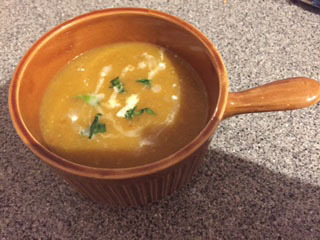 For this nourishing dish, you will need onion, garlic, chilli and squash of course along with 1 Oxo Garden Vegetables with Parsley and Bay stock and coconut milk. Whiz it up and garnish with fresh coriander. Served with some crusty bread this is surely a satisfying meal. Hummus is always a welcome treat that goes so well with fresh vegetables or toasted pita breads. And it is always best when you used dried chickpeas simmered up rather than the canned variety. Blend the cooked chickpeas up with lemon juice, tahini, garlic, cumin, olive oil and some paprika. Last up but not least is this dressed up and fancy pasta dish. 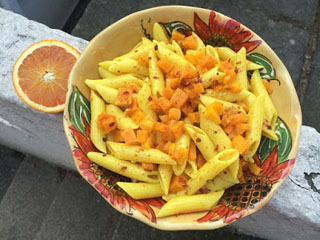 Turmeric is added with pasta and then dressed with Blood Orange Chilli Oil with some chili flakes. When I eat pasta, I would enjoy this dish, no doubt! My dear friend Jacqueline and co-host of this event is hosting for April. Do check Tinned Tomatoes for the announcement.